80,000 words, 272 pages, 164 photographs, 9 5/8" x 9 5/8"
California is famous for its diversity, its eccentricity, and its prophetic influence on popular culture. Since the 19th century, the Golden State has also been one of America’s most fertile climates for spiritual and religious movements. 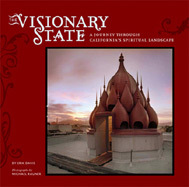 Beautifully weaving together text and image, The Visionary State is the first book to address the full story of “California consciousness.” Ranging from Yosemite to Esalen, from televangelism to Neopaganism, from Mormon pioneers to contemporary Kali worshippers, acclaimed culture critic Erik Davis weaves together the threads of California’s religious history into an enchanting and vivid tapestry. Michael Rauner’s haunting iconic photographs ground the book’s many stories in the sacred landscape and architecture of the Golden State. Together Davis and Rauner map the peaks and faultlines that characterize the place that is both the nexus and far frontier of American religion.